Handcrafted with pride on the Zuni Reservation of Northern New Mexico, this beautiful set features the finest Cast Sterling around. 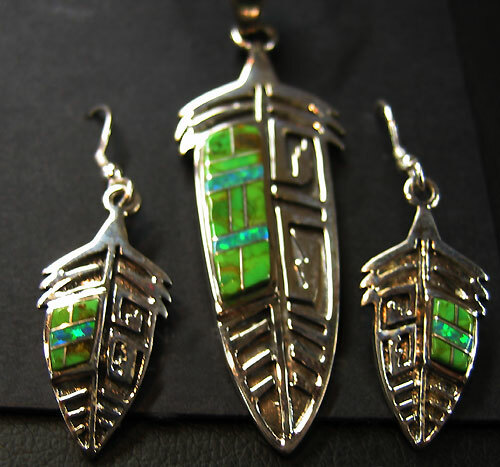 For a unique twist, these pieces also combine the elements of Zuni Wire Inlay. You won't find casting work with wire inlays these days. The definition on these castings is excellent, taking on a petroglyph motif. Gaspeite occurs on the Gaspe Peninsuka of Canada and always adds a splash of color when you need it. The pendant comes with a 16" chain. If you need a different length of chain, please add that request to your message line at checkout and we will do our best to accomodate you.